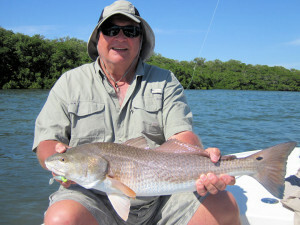 Sarasota Fishing in its bay and backcountry areas offers a variety of opportunities. Its unique combination of grass flats, mangrove shorelines, creek, canals and passes make it a good year-around fishing area. The lush grass flats and mangrove shorelines of the North Sarasota Bay offer great fishing for snook, trout and redfish. Three passes-Longboat Pass, New Pass and Big Pass- flush the bay and provide seasonal action for pompano, bluefish, sheepshead, jack crevalle and ladyfish. Little Sarasota Bay provides a haven for many species of fish during the winter and spring months. Oyster bars, docks and creeks make it a great area for snook, trout, ladyfish, redfish, flounder or sheepshead during cooler weather. 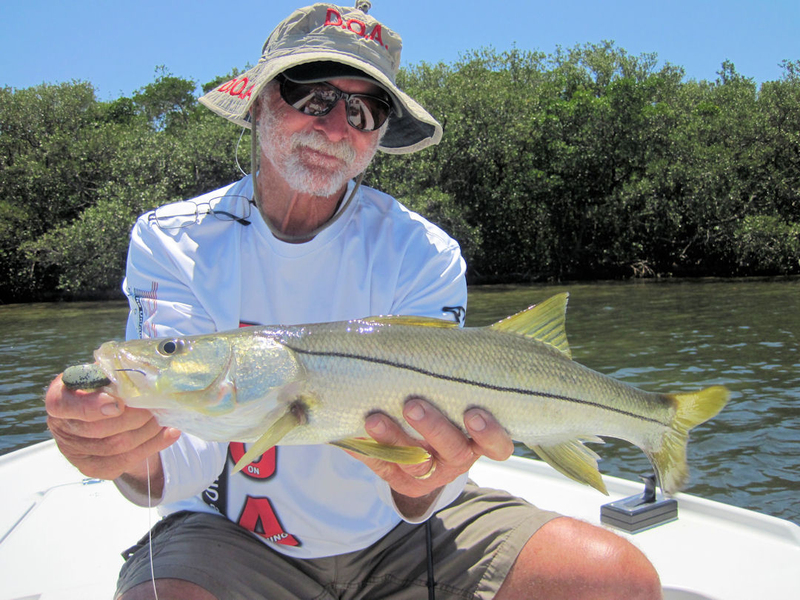 Sarasota Bay is a beautiful bay that is easy to fish due to many different types of habitat. Bill Beauchamp, from Bradenton, FL, caught and released a slam, which included a 24″, 5-pound trout and a 27″ red, on a CAL jig with a shad tail while fishing Sarasota Bay with Capt. Rick Grassett. Mark Nichols, owner of DOA Fishing Lures, caught and released reds and snook on the new DOA swimbait while fishing Sarasota Bay with Capt. Rick Grassett. The bay is a natural for fishing with light tackle and artificial baits and in most cases sight fishing is not only the most enjoyable technique but also highly productive. Likewise, fly anglers enjoy many opportunities for everything from bluefish, jumbo crevalle and ladyfish to snook, trout and redfish. The bay is home to pompano, as well, which we target with spinning gear and jigs. The expansive grass flats of the area of the bay known as the Middle Grounds are home to trout, pompano, cobia, bluefish and crevalle. In the shaddow of the famous Ringling Mansion, the aptly named Ringling Flat is well known for its good trout fishing. The many sand and oyster bars on the east side of the bay are recognized redfish and snook haunts. Cobia are another bay resident. The brute of the Sarasota flats, these powerful fish offer one of the biggest challenges we have on light tackle. *All prices are for one or two anglers. 6-hour trips include lunch.